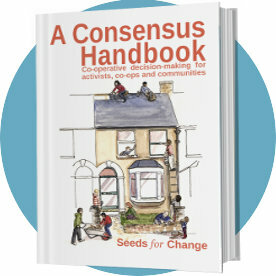 Below you'll find links to some other great organisations in Britain who offer support to co-ops and groups working for social change. Resources such as guides, info sheets and books are available on our Resources page. ○ London Roots Collective - Workshops and training to strengthen grassroots groups working towards social change. London based. ○ Navigate - Workshops and meeting facilitation for groups working towards environmental and social justice. ○ Rhizome - Training, facilitation, mediation for community activists and organisations. Lots of interesting materials about consensus and facilitation on their site. ○ Tripod - Training for creative social action. Based in Scotland. ○ Turning the Tide - Quaker programme promoting understanding and practice of active nonviolence. UK wide. ○ Acorn Coop Support - Expert advice and training on co-operative governance, finance, business and strategic planning. ○ Catalyst Collective - The place to go for help with setting up and registering housing co-ops. Lots of info on their website. Experts in co-operative finances and business planning. ○ Co-op Culture - Training and services for sustainable co-ops: business and finance planning, advice on governance, community share offers. ○ Radical Routes - Network of radical co-ops working for social change. ○ Co-operatives UK - Umbrella organisation for UK co-operatives, runs support programmes. ○ Green and Black Cross - Info and training on legal rights in relation to protest and demonstrations. Legal observer training. Maintain a list of solicitors. ○ The Network for Police Monitoring - Guides on police tactics and legal rights. ○ The Legal Defence and Monitoring Group - Legal backup on demonstrations in and around London (GB). Lots of useful info and guides. ○ Activist Mediation Network - Mediation service for social change groups. Training in skills for dealing with conflict. ○ Activist Trauma Support - Now dormant, but site has useful resources. ○ Counselling for Social Change - Free/low cost counselling service for activists and campaigners. ○ Find your local CVS - Your local Council for Voluntary Services can often provide advice and training. The views expressed in any linked site are not necessarily those of Seeds for Change.